Casio is always known for its popular music keyboards and this time, they have arrived in Las Vegas at CES 2015 with a new series of DJ products for all music lovers. 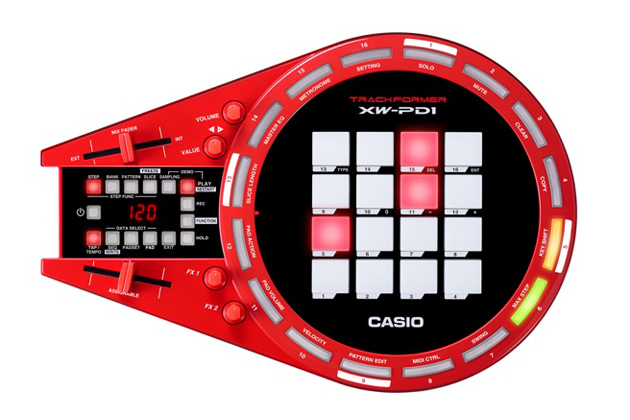 Casio has recently announced its new Trackformer series of DJ controllers at CES 2015, the the XW-DJ1 DJ Controller and XW-PD1 Groove Center that allows individuals to listen to their favorite DJs and musicians and create, mix and play or produce their favorite tracks on their own. The XW-DJ1 works in compatible with Algoriddim’s djay2 apps for iTunes that provides direct controls for cue points, tempo sync, effects, looping and thereby, providing users with more tactile experience for mixing and performing music. The XW-DJ1 is portable and comes with built-in speaker that brings more enjoyment to its user. The XW-PD1 Groove Center on the side comes equipped with the sound engine from Casio’s widely-popular XW series of synthesizers which brings preset patterns from professional beat makers that cover dance music genres like Trap and EDM and help manipulate the sounds. The design includes 16 velocity-sensitive pads and 4 knobs for fast real-time music, along with an outer ring containing 16 buttons that allows user to check the current rhythm pattern at a glance. The XW-PD1 also features drum sounds for a variety of styles such as Hip Hop, Trap, and House. Not only that, bot the Trackformer series DJ Controllers i.e the XW-DJ1 and XW-PD1 can be used simultaneously in connection with each other. The audio output of the XW-DJ1 can be connected to the audio input of the XW-PD1 so the two units that allow users to do live remix performances and thereby, utilizing the unique capabilities of each product. As far as its availability and pricing is concerned, the XW-DJ1 DJ Controller will be available in the US from beginning January 2015 for $299 while the XW-PD1 Groove Center will be available from March 2015 for $399.